A scene from the blockhouse during the Freedom 7 recovery operation. 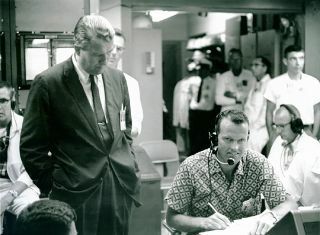 In this historical photo from the U.S. space agency, Dr. Wernher von Braun and Astronaut L. Gordon Cooper are in the blockhouse during the recovery operation of MR-3 (Freedom 7) mission on May 5, 1961. The MR-3 mission, a 15-1/2 minutes sub-orbital test flight, put the first American, Astronaut Alan Shepard, in space.